Four Skolkovo startups working in the field of sports and entertainment tech demonstrated their products to a senior manager from the German software giant SAP at the Skolkovo Technopark last week. 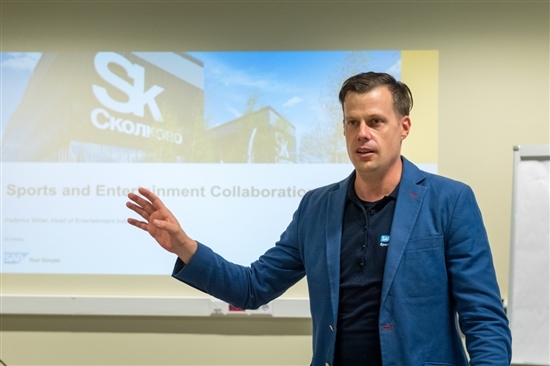 Federico Winer, head of entertainment industry technologies for Europe, the Middle East and Africa (EMEA) at SAP, visited the Skolkovo innovation city for two days last week on the hunt for talented tech startups in Russia. Federico Winer, head of entertainment industry technologies for EMEA at SAP, at the Skolkovo Technopark. Photo: Sk.ru. “We have 15,000 partners across the globe, but we don’t have too many here [in Russia] at the moment and we would love to have more, that’s one of the goals of this visit,” Winer told representatives of the Skolkovo Foundation’s IT cluster and four of the cluster’s startups who presented their products to him: Third Opinion, an AI-based platform for analysing medical images such as MRI scans that can also analyse body movements for use in the fitness industry; Immergity, which creates virtual design for use in gaming and interior design; Webgears, which creates interactive web 3D content; and Fitstarter, a digital platform that helps tennis enthusiasts to find a court or a partner. SAP makes enterprise software to manage business operations and customer relations, and sells its approximately 700 products and platforms to 350,000 customers in 180 countries, said Winer. The B2B company, headquartered in Walldorf, Germany, covers 35 industries, ranging from oil and gas and manufacturing to sports and entertainment, for which Winer is responsible. In Russia, the corporation works in this field with cinemas and the major betting company Liga Stavok, as well as with the Belarusian developers behind the hugely popular online game World of Tanks. “We focus a lot on innovation; we have industry expertise to share with you guys, and we also want to learn from you, and then innovate together,” said Winer, who is a member of the Skolkovo pool of mentors. 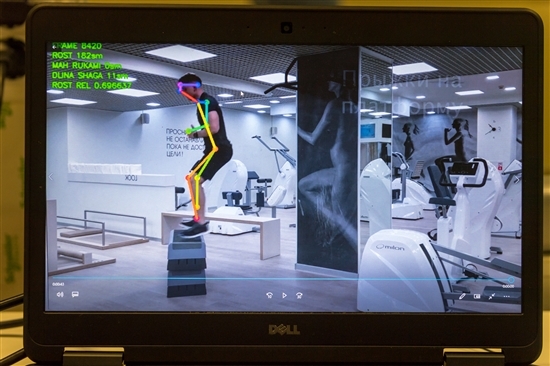 Third Opinion, a resident startup of the Skolkovo Foundation's IT cluster, has devised a system that can analyse body movements for use in the fitness industry or for rehabilitation purposes. Photo: Sk.ru. 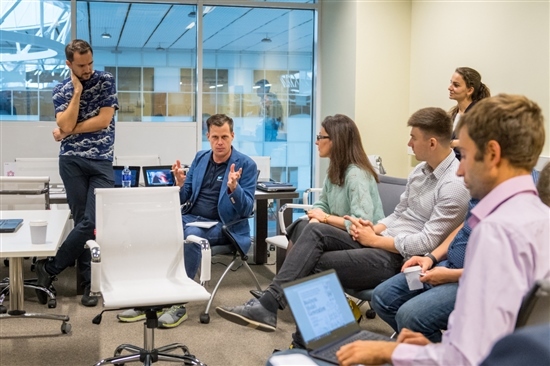 SAP has its own programme for entrepreneurs, SAP Startup Focus, which provides tech entrepreneurs with software and mentor support without taking any equity, he told the Skolkovo startups. The multinational corporation gives selected startups free access to its latest software package, the HANA business suite, for a certain amount of time, and can also help small businesses to find clients or partner companies. Winer told Sk.ru he had been impressed by what he saw during his two-day visit to Skolkovo, during which he also toured the Skolkovo Institute of Science and Technology (Skoltech). “I was impressed by the scale of this centre of science and technology development, focused on business,” he said. SAP's Winer met with four Skolkovo IT startups and gave them feedback on their projects and presentations. Photo: Sk.ru. “There’s an idea that such projects exist only in the U.S., in Silicon Valley, or in the EU and the U.K. Yet I’ve seen with my own eyes how fast the Skolkovo project is developing, and it seems to me that it’s moving in the right direction, especially as far as the educational part is concerned: I believe that the connection between education and business is absolutely the right approach, because that is the only way that education can develop stably,” said Winer. Following the presentations, the SAP manager had some advice for the startups. “It’s not enough to create a good project; you must always have a clear picture of who your client is,” he told Sk.ru.